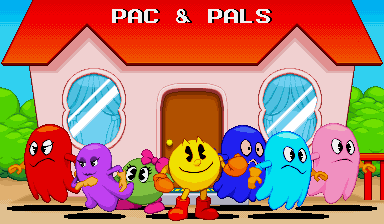 New sprites of Pac-Man, the original four ghosts (Blinky, Pinky, Inky & Clyde), Sue and Miru (from Pac & Pal) have been added to the new Pac-Man custom sprite gallery and the GFX Generators. 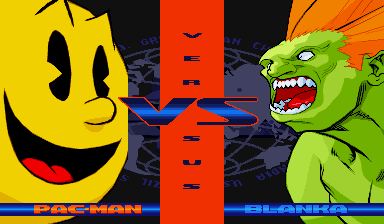 The new Pac-Man gallery also has the animated scenes I posted on Friday, Pac-Man’s 35th anniversary. The Generators (the ones that use fighting gamek-style sprites) also have a new scratch-made background based on the Pac-Family home from Pac-Land and the Group 384×244 variable pic now has the 16×16 font from Namco Classics Collection vol 2 that looks like a bigger version of Namco’s classic font. 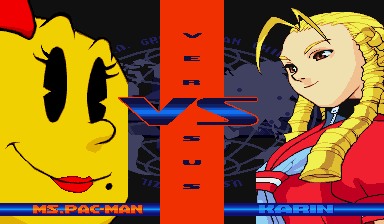 BTW: Ms. Pac-Man got a new sprite in the Mother’s Day update, so don’t feel that she was neglected this time! Added to the GFX Generators and the Custom Portraits gallery. Steam has knocked 75% off the price of PAC-MAN Championship Edition DX+ (and its DLC) for the anniversary, so jump on that sale while it’s still blue! Expect a site update this weekend with new Pac-related sprites and a new background! Combat Core has returned to Kickstarter! This 3-D arena brawler doesn’t plan to half-step one bit! The WIP from MABManZ has new voice work and beautiful artwork by Robaato. The Alpha build already shows how much fun this game is going to be and it’s only going to get better. A Power Stone-like game with character customization? I CAN FEEL IT. Hit the Kickstarter page to download a playable alpha build of the game and give if you can! Arcade Quartermaster just dropped a Dinosaurs vs. Ninjas update with new shrines for Jurassic Park, The Legend of Kage, The Ninja Kids and The Ninja Warriors! A lot of hard work goes into those shrines, so be sure to let Shadi know which shrines are your favorites! This update pays tribute to all the mothers out there by featuring new sprites of video game mothers! 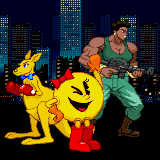 Custom Sprites: Ms. Pac-Man was added to the Namco Gallery, Big Mama (from Shock Troopers) SNK gallery, the mama Kangaroo from the Sunsoft classic, Kangaroo, was added to the Sunsoft gallery. The new sprites are also in the GFX Generators where you can make graphics like that pic on the side. Comments Off on Happy Big Mama’s Day! Those custom sprites and mini-logos were added to the GFX Generators that use fighting game sprites. 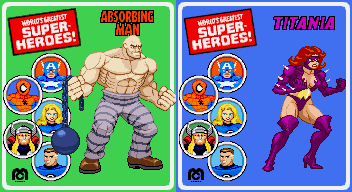 Sprites – also added a few in-game items to the Captain America and the Avengers page. That’s all the Avengers-related stuff I’ve posted in the past week to celebrate the new movie… that I still haven’t seen yet. There will be a small Mother’s Day update this weekend as the site goes back to doing game-related content! Anyone in the mood for some 2-D avenging should check out the Avengers: United Battle Force game built on the OpenBoR engine. O Ilusionista crafted this mod with more Marvel goodness than you’d think was possible in a fan game. Believe it or not, I had a brief cameo on local TV during the Free Comic Book Day event at All American Comics in Warren, Ohio and I was working on the line art for Absorbing Man, Titania and a few other sprites. Just look for the guy in the gray hat squinting at a piece of paper at around the :35 mark (though I show up a bit earlier than that). I honestly didn’t know they were filming me until I looked up as the cameraman was about to leave. TOTAL CONCENTRATION. This week-long thing wraps up today with two of the biggest sprites of this whole Avengers celebration and I hope they’re worth the wait. 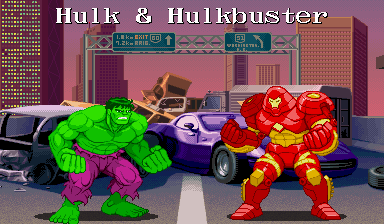 All-new scratch-made sprites of the Incredible Hulk (classic) and Iron Man’s original Hulkbuster armor have been added to the Marvel custom sprites gallery and the GFX Generators. That wraps up this (almost) week-long Avengers celebration and I hope you comic fans enjoy the sprites, especially in the image generators. 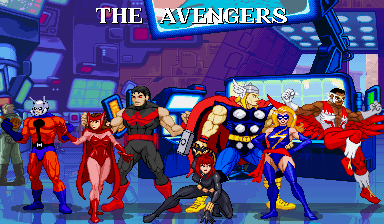 The whole Captain America and the Avengers beat ’em up cast is finally complete, though I know I’ll resprite some of those characters in the future. There will be more comic updates in the future, but it’s time for me to get back to the game-related content. In fact, you’ll see that in a small update this weekend. So soon? Yes. That soon. He’s a magically-transforming career criminal who never changes his pants. She’s a former 98-pound weakling turned super-strong brickhouse with an outfit that’ll poke your eyes out. TOGETHER, THEY MAKE CRIMES. Mini-Logos – Absorbing Man and Titania’s logos from comic covers have been added were added to the Marvel mini-logo page along wiht Thor’s original logo. As always, the new items were added to the GFX Generators. One last mini-update drops tomorrow! Marvel’s Black Widow and Wonder Man return and they’ve brought Capcom’s Black Widow along for back-up! Here for less altruistic reasons is the other Wonderman (made from my Superman Battle Hover sprite base), the one from the TV Funhouse cartoons (seen on SNL and it’s own beloved short-lived Comedy Central show) that are far from kid-friendly. I also fixed up the WCA-style Wonder Man sprite from before. Avengers Assemble 2015: She’s not the Space Pirate you’re looking for. Look, I know it’s May 4th (May the Fourth be with You and all that), but I’m in the middle of an Avengers-themed series of updates, so I’ll meet you half-way with a sprite (and mini-logo) for Nebula, the space pirate. That pose is based on her stance from Marvel Super Heroes: War of the Gems. I even made a mirrored version of her asymmetrical badness so she’ll look correct in both directions. As with the earlier updates, you’ll find her in the Marvel custom sprite gallery and the GFX Generators. Comments Off on Avengers Assemble 2015: She’s not the Space Pirate you’re looking for. … is not gold, but most of this mini-update is! Brand new sprites of Iron Man’s Mk. 1 and Mk. 2 armors and Moonstone (original outfit) have been added to the Marvel custom sprite gallery and the GFX Generators, where the Iron Man armors use the same palettes as the classic Capcom sprites (I added an all-iron palette for that Mk. 1 armor). Moonstone also got a mini-logo. You can see me at the :35 second mark wearing a gray hat and my Minus World Skull shirt. Now you know who the guy is who randomly pops up on the Shop index page. I didn’t realize they were right there until the filming was over and the cameraman was getting ready to leave. Always remember that the pixel mines struggle is real and the concentration of a Shaolin monk is needed to survive the rugged conditions. You’ll see more fruits of my in-store labor throughout this week! Avengers Assemble 2015: Okay, GOOOOOOO! Captain America, Iron Man and Thor have been favorites of mine ever since I was a toddler watching a syndicated show that aired their old cartoons from the 1960s, so no one has to twist my arm to have an Avengers-themed update. 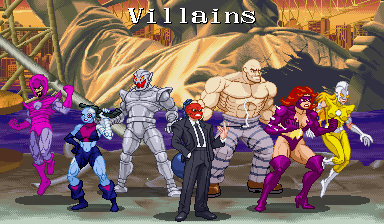 Marvel Comics: New scratch-made sprites of Ant-Man, the Black Widow, Thor, Ultron (80s), Scarlet Witch, Ms. Marvel (Danvers), the Red Skull, Wonder Man and the Wizard were added to the Marvel Custom Sprites gallery and the GFX Generators (Wizard is in the “Other Marvel villains” character slot there). The 16×16 font from Captain America and the Avengers (the one used in the big screenshot up there) was added to the 384×224 Variable group pic in the GFX Generators. 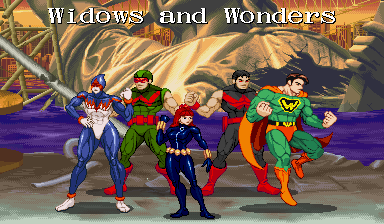 Wonder Man and the Wizard were the last sprites I needed to complete the cast of Data East’s “Captain America and the Avengers” beat ’em up cast. I even resprited the Red Skull to (hopefully) be better than that edit I made years ago. Don’t expect the tributes to that game to stop, because I’ll probably replace more of those characters’ sprites. Mini-logos – Ultron and Wonder Man logos were added to the Marvel gallery. Stay aware: there might be a small additional update this weekend. I’ll be at setting up shop at All American Comics and Cards (Warren, OH) (directions here) this Saturday during Free Comic Book Day, so stop on by if you’re in the area! I’ll have prints for sale, including a few copies of that Horror pixel art pic, and I’ll probably be sketching line art for future sprites. I almost quit reading comics in the mid-90s for a bunch of reasons (more on that in a later update), but the All American Comics shop is a big reason why I hung in there. Give them a shot if you can make it to either the Warren or Boardman locations in Ohio! Comments Off on Avengers Assemble 2015: Okay, GOOOOOOO!